Northeast Kingdom Vermont, Fall 2012- As the Conservation Organizer for the Vermont Sierra Club I am happy to report that in 2012 we made extraordinary progress in advancing a new Tribal Forest model of conservation in Vermont . And now, with your support, we intend to close on the first Nulhegan Abenaki Tribal Forest in over 200 years by the first of the year. This first, modestly sized, tribal forest (70 beautiful acres in the heart of Nulhegan traditional territory) will be in Barton, in the Northeast Kingdom, and will be owned directly by the Nulhegan Abenaki Tribe, with permanent conservation easements on the land held by the Vermont Land Trust and the Vermont Housing and Conservation Board (VHCB). With help from many friends and partners, such as the Vermont Workers Center and Northeast Kingdom State Senator Vince Illuzzi-Republican, we successfully gained the support of the Town of Barton for the project, and have now secured $112,000 in grant funding for the land purchase through VHCB. This first model forest will forever conserve the land as wildlife habitat, and will allow the Tribe to generate up to 1000 gallons, annually, of maple syrup. Through this activity the Tribe will generate up to $30,000 a year in gross revenue, which, in turn, they can invest in further forest purchases or social programs for their low income tribal citizens. This first tribal forest will also allow the Nulhegan Abenaki a place to hunt, gather, and pursue tribal-community gardens in existing clearings. But for us, this is not an end; it is a beginning. The truth of the matter is we are not saving our forests through one successful, tribal forest project, no matter how historic it is. From an environmental point of view, this project is important because it serves as a pilot program; a working model that can be replicated on a grand scale; as an Abenaki State Forest! We have therefore brought our idea to the Governor, the Vermont Agency of Natural Resources, and the Vermont Department of Forests, Parks, and Recreation. Over the summer we presented the state with a petition signed by over 1000 Vermonters stating our common support for new tribal forests. We, along with the Chief of the Nulhegan Abenaki Tribe, Don Stevens, also met with the head of the Agency of Natural Resources, Secretary Deb Markowitz, and Commissioner Snyder of Forests, Parks and Recreation. We made our case, and, in turn, heard their point of view. 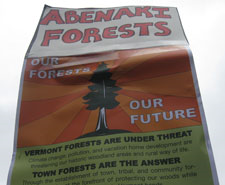 As a result, the State of Vermont is now open to the basic concept of Abenaki State Forests, as a place where the state would still retain ownership and official management responsibilities, but where the Tribes may be allotted a special relationship to the forests whereby they may utilize the land for low impact cultural activities, gathering of resources, access to firewood, and possibly sugaring rights. This understanding is still a work in progress, but we are very pleased to report that the state is open to the idea. In fact Secretary Markowitz has told us that Vermont would "consider" a proposal for a new Abenaki State Forest through the regular, competitive, application process. So of course we still have a very long row to hoe, but with the establishment of this first 70 acre Abenaki Tribal Forest, we will have a real working example of what we are aiming for. In turn, we look forward to pivoting the Our Forests Our Future campaign towards a large Abenaki State Forest project after we close on this first project. And with your continuing support and direct participation, we intend to further pursue this innovative tribal-state model in order to achieve meaningful forest conservation, and sustainable social, economic, and cultural development opportunities for Vermont's lowest income and most endangered of peoples; the Abenaki. “Hello Vermont Workers, Farmers, Environmentalists, Abenaki, and Revolutionaries!!! My name is Luke Willard. I’m the Chairman of the Vermont Commission on Native American Affairs, a Firefighter and Rescuer, and I’m a Conservation Organizer for the Vermont Sierra Club and the Nulhegan Abenaki Tribe in the Northeast Kingdom. Just over a year ago, I was here to celebrate the state recognition of the Nulhegan, of which I am a member, and Elnu Abenaki tribes, and I’m very happy to report that I will be here again six days from now to celebrate the state recognition of two more tribes… the Koasek and the Missisquoi! “As a Conservation Organizer, it is my job to work at the grassroots level to encourage communities to create their own Town and Tribal Forests. We call it the OUR Forests OUR Future initiative… and we do not stand alone! So I give a shout out to the Vermont Workers Center, the AFL-CIO, 350 Vermont, and many others. “So what is Our Forests Our Future? My people have known for centuries that the land we walk upon is a gift. From this land, my people were able to meet their every need while maintaining the health and beauty of the land we call N’dakinna in the Abenaki language. Today, most know it as the Green Mountain State… Vermont. Unfortunately though, this gift has been taken for granted. “Greedy corporations, self-interested out-of-staters, and even some Vermonters who have traded in their birthright for real or imagined swollen bank accounts, do not see the majestic mountains, and miles of forests. They do not see the herbs of spring, the bounties of late summer, and the colors of autumn. They do not hear the ripples of a mountain stream, the call of the loon, or the wind as it dances with leaves of a giant Vermont maple. They do not benefit from growing organic vegetables or the blessing of a deer or moose who sacrifices itself to complete the circle of life. They only see potential development, dollar signs, a place to put their pollution, and an investment in vacation home development for the wealthy who reside in lands far south of these green and rugged hills. These people, the advisories of Vermont’s working families, only hear what they want to hear. They only see the alleged benefit from the gain of elitist non-productive economic and political power, and they seek to exchange that which could serve the community, for the destruction that can only result from their personal gain. This is the challenge set before us as we, today, declare that a healthy and vibrant forest, a clean and sustainable environment, is a basic birth right of all Vermonters! “My people, the Abenaki, also know that this planet is changing. Our climate is changing. But as we adapt to these changes, it is necessary for us to lend a hand to our four-legged friends so that they may adapt to our changing environment by establishing forested migration corridors particularly in the northeast so that animals have a safe route from the spine of the Green Mountains to the vast forests of northern New Hampshire, Maine, and Quebec. We propose doing so through the creation of a mosaic of new town and tribal forests! “But let us not forget the two-legged creatures… you and me. Moms, Dads, Grandmothers, Grandfathers, and our greatest resource… our children. In exchange for our stewardship… yours and mine… Town forests and tribal forests can provide clean air to breath and clean water to drink. They can also provide essential food and medicines that haven’t been poisoned by synthetic fertilizers, hormones, and genetically modified organisms… Firewood for the disadvantaged and/or elderly… Cooperative maple sugaring… and a place for teachings our children the simplicity of sustainable living and stewardship! “Last year, over 1500 people signed our petition for the creation of new town forests. These petitions were delivered to the Governor and leaders of the Vermont General Assembly. We are pleased to report that this year the Governor is supporting increased funding for the Vermont Housing and Conservation Fund. This year, though, we are circulating a new petition… one that will demonstrate Vermont’s overwhelming support for Tribal Forests! It is our intention, this summer, to deliver this petition to the Governor, and to work with the administration to secure the first true and new Abenaki forest in over 200 years! “After 400 years of oppression, genocide, eugenics, and the near eradication of our culture and our people, it is time that the first Vermonters, the original Vermonters, the Abenaki, win back a meaningful piece of what was once all ours! We demand tribal-communal lands that we can hunt, fish, gather wood, and medicine. We demand a return of those tools of nature which were stolen from us generations ago. We do not stand before you today asking that we be become a ward of the state. No my fellow Vermonters; we stand before you today to demand that we be allowed the resources to not only safeguard our environment, but also to take care of our own people!! We here today to declare that the time has come to establish Abenaki Tribal Forests in the Great State of Vermont! “Let me be as clear as I can… We do not seek acceptance or recognition from a federal government which is marred in blood, war, imperialism (both abroad and at home), corruption, inaction, and failure. We do not seek rights to gambling or other vices. We simply seek to work with the State of Vermont in setting aside lands which we can preserve in its natural state, and work according to our traditions; those which predate 1492 and 1791. We seek a place in these Green Hills that we can, again, call our own! “And here, we know we are not alone. We have been working with the Vermont Sierra Club and others represented in this crowd today to achieve these goals. 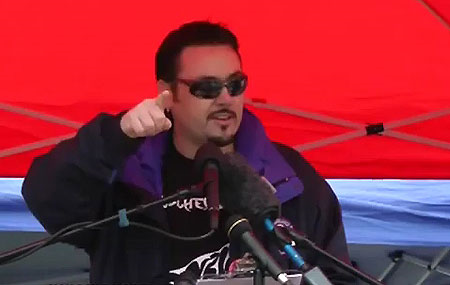 We understand that our battle will only be won through a grand and united Popular Front composed of all those individuals and organizations who are gathered here today in solidarity! And in turn, we, the Nulhegan Abenaki, look forward to working with you to see that Vermont Put’s People and The Planet First! “So, as the sun goes down over this failed empire of greed, we, the Abenaki people, the People of the Dawn, reach out our hand in friendship to all Vermonters; be they the sons and daughters of the Green Mountain Boys, the grandchildren of Québécois immigrants, or more recent arrivals. Together we are Vermont Strong and together we will win! “When I step down from this podium, I will have one goal and that is to collect your signatures showing your solidarity and support for the Abenaki people, tribal forests, preserving our environment and all those who inhabit it. “SUPPORT THE NULHEGAN ABENAKI TRIBE! SUPPORT TRIBAL AND TOWN FORESTS! A version of this letter was sent from David Van Deusen (co-founder of the Green Mountain Anarchist Collective) to members of the Vermont Sierra Club in 2012. this campaign, in part, sought to expand the Abenaki's resources and aid in their ability to build a duel power in Vermont. Chief Willard’s May Day speech was co-written by Willard and Van Deusen. This effort resulted in the creation of the first Nulhegan Abenaki Tribal Forest in over 200 years. This Tribal Forest exists in the Northeast Kingdom of Vermont. In addition to providing the Tribe (which, although officially recognized by the State of Vermont, does not have reservation lands) with common hunting grounds, is also a working sugar bush providing collective income to their citizens.